﻿ NIGAWA GAKUIN » Thanks for visiting, Emie! 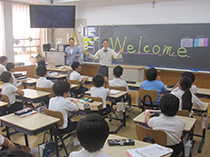 The junior high and elementary schools were recently lucky enough to have a special overseas visitor. Emie was born and raised in France, but has been living in Singapore for the past several years and decided to take advantage of her school holidays to experience Japanese school life for the first time. As with previous visitors, our students were keen to ensure that Emie made the most of her time with us through various activities, only wishing that she could have stayed longer. Using her remarkable language skills in English, Japanese and her native French, Emie taught us about her home in France and her current life in Singapore. She also joined several elementary school classes receiving an enthusiastic welcome from the 5th and 6th graders (see picture). We will be sure to stay in contact with Emie and look forward to her next visit later this year. Merci, Emie! Copyright (C) 2013 Nigawa Gakuin. All Rights Reserved.